The Express 800 Gallon Water Trailer allows you to carry the maximum volume of water without obtaining special certifications. * Featuring a 4 HP Honda gasoline engine and a 2-inch aluminum pump, you'll have all the water you need for your job site, farm, or residence in one convenient tank. Additionally, moving between locations is made easy knowing that your 800 gallon trailer's DOT safety requirements have been satsified, allowing you to take the trailer onto public roadways with confidence. 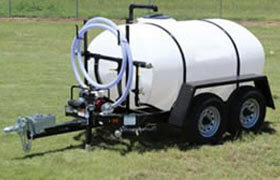 *In many states, water trailers with under 10,000 gvwr capacities do not require a CDL or special certifications. Check with your local DMV for specific requirements. 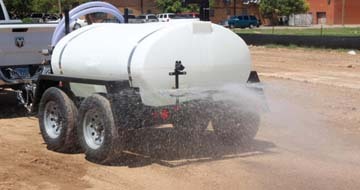 The Express 800 Gallon Water Trailer features an elliptical-shape design, giving it a lower center of gravity which makes it easier to maneuver and control. Additionally, the tandem surge brakes can allow your small water trailer to brake with your truck for safe driving on any surface. Standard diamond-tread fenders provide protection from road debris or gravel and to minimize spray or splash of water or dirt. If you need to use a public road to get to your needed location, the trailers are DOT approved. If that's not enough, the Tsurumi aluminum pump is supported by a Honda engine, providing superior performance. 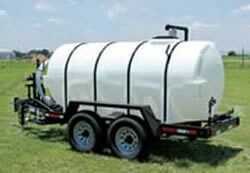 800 Gallon Water Trailer Specifications (pdf). 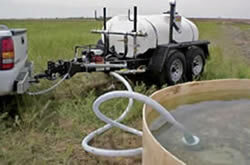 If you need a water trailer with larger capacity, this model is also available with 1000 gallon and 1600 gallon tank sizes. The tank's white exterior makes it easy to see the water level so you can easily manage it during any filling or usage. For additional information, please see our 800 Gallon Water Tank Trailer Specifications and Drawing (pdf). If you find that your project requires customized options for your water hauling trailer, consider the Argo Water Trailer, by GEI Works.